Dongchimi literally means “winter kimchi” because it’s traditionally made right before the cold winter starts in Korea. In late fall, we can find small, palm-sized radishes in the market, and we start thinking “Oh, it’s time to make dongchimi already!” The radishes harvested around that time of year are firm, crispy, and sweet. But these days the small radishes are seen year ’round in Korean grocery stores here in North America. You can make dongchimi anytime, whenever you find good quality radishes. When I was high school in Seoul, I lived with my grandparents. My grandmother made her dongchimi in a huge earthenware pot. She used regular-sized radish which is very large, heavy, crispy, juicy, and sweet. Some leftover radishes were wrapped in newspaper in a plastic bag. She peeled and cut them into sticks. That’s our snack! Crispy and sweet! But you can’t compare the sweetness with cupcakes or chocolate. It was sweet enough for us though. All of my siblings were eating radish sticks just like rabbits quietly, “sheguruk shegruk…” into the long winter night : ) When you find radishes where the green part is larger than the white part, they are usually sweeter. When I was in my high school, I had 3 best friends. We sometimes cooked together, so every time we got together, we needed to decide what to cook. It was usually just a simple dessert such as fried apple fruit balls, kimchi jjigae, or Korean style curry rice. Yes, I usually drank the broth straight out of the bowl instead of using a spoon. Spooning was too slow to satisfy my thirst for the delicious broth. Because my grandmother made a huge amount dongchimi, we could enjoy it for a long time. Her earthenware pots, filled with dongchimi, were in the corner of our garden and there was a layer of ice frozen on the top. I didn’t learn this recipe from my grandmother. This recipe is my own mother’s recipe. When I visited her in LA, she let me taste her dongchimi. It was so tasty. My mother actually places the salted radish in a jar in a cool place at home for a couple of days instead of putting it in the fridge, as I do in the recipe. I modified her recipe a little by placing the jar in the fridge because lots of my readers are living in warm countries. What if their dongchimi goes bad during the salting process? Best to keep it in the fridge. I will post my dongchimi guksu recipe soon. If you make dongchimi, it will be perfect timing to make guksu when my next video is released. You’ll also need a large glass jar that can hold 6 quarts (6 liters), or 24 cups. Wash the radishes in cold water with a sponge to remove any dirt. Put ⅓ cup sea salt or kosher salt in a large and shallow bowl. Roll each radish in salt with your hands to coat evenly. Put the salted radish into the glass jar. Put some green radish leaves on top and add the leftover salt. Close the lid and keep it in the refrigerator for 4-5 days. Wrap ginger and garlic in cheese cloth and tie the ends. Place it inside the jar. Make a few tiny holes in red and green chili peppers with a fork, and add them to the jar. Add the onion, green onions, and pear. Pour in about 2 liters of water (9 cups) and stir the brine mixture with a wooden spoon to evenly distribute the salt. 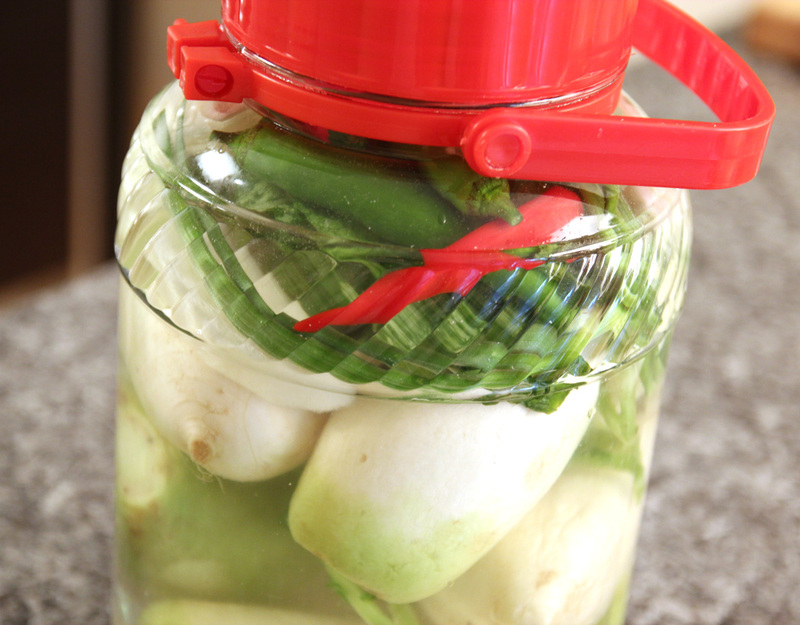 Close the lid and let it sit at room temperature for 2-3 days until it ferments. When it ferments, the brine will get a little milky and it will taste a little sour. It will also smell sour and some bubbles will float to the surface. At that point, always store it in the refrigerator and take some out whenever you serve it. Serve with rice, noodles, steamed sweet potato, steamed potato, or rice cake. Cut one radish into half lengthwise. Slice one of the halves into ⅛ inch thick half-moon shape pieces, or slice it into 1½ inch x ½ inch and ½ inch thick strips. Garnish with chopped green leaves, red and green chili pepper. Serve cold, with some ice cubes if you like. Posted on Monday, May 7th, 2012 at 9:01 pm. Last updated on October 5, 2014. Posted March 21st, 2019 at 2:41 am | Log in to reply. will cut cubed exposed radish work? This recipe was originally posted on May 7, 2012 at 9:01 pm by Maangchi. It was last updated on October 5, 2014. The video was watched 283,318 times on YouTube & has 2,632 likes!